Buyers of Lleyn Sheep are now left in no doubt about the purity of the sheep they are buying with the introduction of the green Society Tag. With the huge take up of the tag, the Lleyn Sheep Society has decided to make the tag available again for 2007. 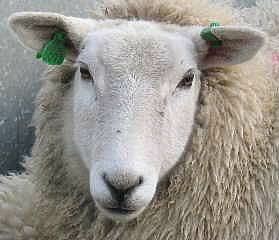 So all ewe lambs at society sales this year will have a “white” tag in their right ear. The tag instantly identifies to purchasers that the sheep they are buying are pedigree registered Lleyn sheep. With this identification it should help buyers unintentionally buying non pure/registered Lleyn sheep. Father and son team of Eifion and Dewi Ellis, who run a 900 pure bred Lleyn flock in North Wales, are 100% behind the new tagging system. “It is the way forward for the Lleyn. I’ve supported the idea from the start and I am convinced it’ll be a big help to purchasers who’ll know exactly what they are buying,” says Efion. The society tag is inserted in the ewe lamb’s right ear (from behind). Once the society receives the ewe lamb’s registration details and payment this then triggers the production of the unique tag by the manufacturer, who cannot produce any tags without the prior instruction of the society office. Within days the tag is delivered to the breeder, the tag is then simply inserted in the ewe lambs right ear. All rams that pass the society inspection will carry an official breed society yellow tag, which is inserted by the society ram inspector when he passes the ram. The Lleyn Sheep Society is looking to offer sheep breeders across the UK and Europe the opportunity to purchase registered pedigree Lleyn sheep. The Lleyn is the fastest growing breed of sheep in the UK. Farmers are impressed by its versatility to adapt too many situations, its tremendous mothering ability, milkiness and prolificy, coupled with being able to stock more Lleyn to the acre. It soon becomes apparent that the Lleyn is more profitable than many of its counterparts. Look out for the white faced sheep with the little green or white tag; it may well help you to be more profitable in the years ahead! !